Judy Kelley is a Eustis Florida Realtor specializing in lakefront, estate and retirement real estate. Eustis is a charming small town that is currently in the process of completely reinventing itself. In 2003, the Waterman Hospital, which dominated the downtown Eustis skyline for many years, relocated south to Highway 441. This move created a large new downtown area ripe for development. Eustis is a unique waterfront City with a downtown area virtually on the shore of Lake Eustis. The City docks are open to the public and it is possible to dock your boat and walk a short distance to dine at restaurants and browse the many small shops that line the downtown streets. Downtown Eustis is vintage Norman Rockwell, where one can walk brick-laid streets, feel the breezes from majestic Lake Eustis, smell homemade sourdough bread or see a play at the Bay Street Theatre. 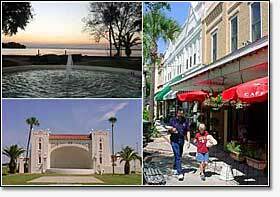 In fact, in 1993 Eustis was named a Main Street City, one of only a handful in the State. History buffs will enjoy a visit to the Clifford House, a Neo-classical Revival house serving as the Eustis Historical Museum. The 18-room mansion was built in 1911 and features pinewood floors, brass fixtures, six fireplaces and Italian tile throughout. The house was placed on the Registry of Historic Places on 1975. Weekly afternoon tours are available to the public. Ferran Park on the shores of Lake Eustis is a popular retreat amount locals, the site of sailing regattas, 4th of July festivals, the Lake Eustis Fine Arts Festival, held in November and the Light Up Eustis Christmas celebration. The Eustis downtown merchants sponsor frequent street festivals with live entertainment and a popular monthly classic car cruise. The Eustis Lake Walk is a new addition to the town. It is a modern concrete boardwalk with beautiful iron gates and railings where you can walk the lakefront and may even see someone catch a fish or two. The Lake Eustis Foundation was established to develop the new downtown area opened by the hospital's departure. New retail/office space is being planned on the first floor and 2 story townhouses above street level. The City of Eustis' motto is "The City of Bright Tomorrows". Nowhere is a motto more fitting than on this beautiful Florida City on the Lake.